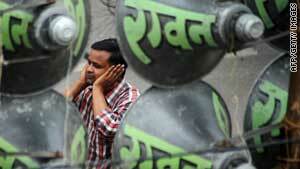 Residents in major Indian cities will now have to keep their noise below the new limits. New Delhi, India (CNN) -- Indians live with noise. Funnel-shaped loudspeakers mounted atop houses of worship blare before dawn. Painting a big "Horn Please" sign on the rear bumpers of trucks, buses and vans muscling their way down the country's clogged roadways is common now. Giant generators roar in neighborhoods during power outages. Residents bear the crackle of machines from factories that might be operating clandestinely in officially non-commercial areas. Rarely is a celebration -- religious or social -- held without loud music. But Indian policy-makers have prepared what they call a road map aimed at controlling pervasive noise. And one of the latest steps they have taken is to give comfort to citizens at bedtime. They have defined night in legal terms. "The nighttime has been defined (10 p.m. to 6 a.m.) and restrictions have been imposed on the use of horns, sound-emitting construction equipments and bursting of firecrackers during nighttime," the federal environment ministry said. It also outlined what constitutes a public place and limits sound amplification from such locations. Residents will have to keep their music below new limits, as set by amendments to the nation's noise rules, the ministry said. Indian officials also announced noise-monitoring stations in major cities, including New Delhi, Mumbai and Bangalore, by September. Eighteen more cities will join the system by 2011, the ministry said. "With the new system in place, a systematic national level monitoring and reporting network in the country will be available, as in case of air and water pollution." Environmentalists welcome the moves. Nevertheless, they see enforcement as a big challenge -- and awareness even bigger. Anumita Roychowdhury, an expert at the nonprofit Centre for Science and Environment in New Delhi, said noise violations occur despite existing laws and court orders. "People have to develop self-discipline and authorities the capacity to monitor noise and enforce the laws to contain its high levels across the country," Roychowdhury said. So far, both are limited, she added.